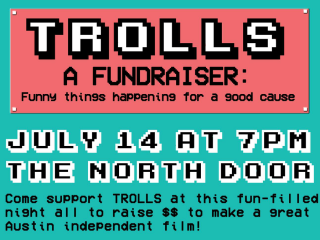 The filmmakers behind Trolls (a comedy about a tech start-up battling a patent troll) are throwing a sweet fundraising party with tons of nerdy entertainment. There will be local comedians, live music, burlesque from Miss Fahrenheit, a classic video game contest and more. Admission is free; $5 suggested donation.